WinterBlue Cattery - Siberian kittens for sale in CT, NY, NJ, Long Island, hypoallergenic, blue eyes, located on East Coast, West Connecticut. Cats for Home. Pictures and Videos from one of last litters are here. Welcome to Winterblue Cats Cattery! 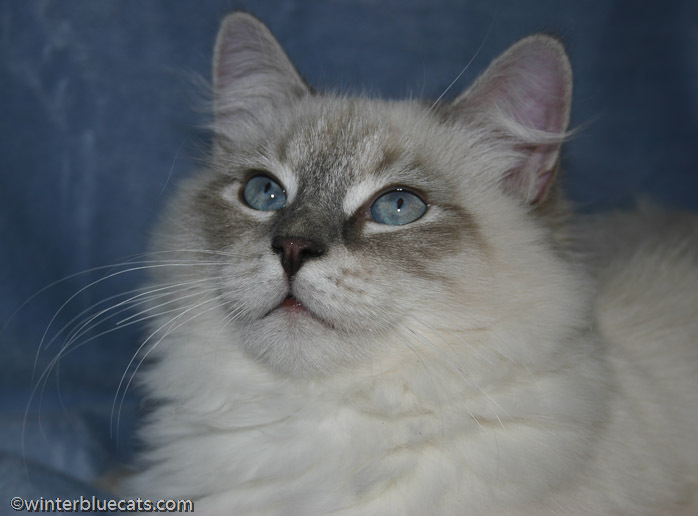 Located in Stamford, CT, we are a small family-based cattery specializing in breeding Champion pedigree Color-point Blue-Lynx Siberians, also known as the Neva Masquerade. Possessing a beautiful crème-white coat, with the signature mask on the face, and markings on the ears, paws and tails, the Neva is a rare division of the Siberian breed that is quickly gaining popularity. These cats are famous for their loyal, almost dog-like personalities, friendly tempers and their hypoallergenic coats. Perfect pets for families, our kittens will fill your life with fun, companionship and love. Welcome and please look around! Currently we are accepting deposits for the kittens of current and next litter.